Industrial packaging | Forag, s.r.o. you can always rely on. Package fast and easily! 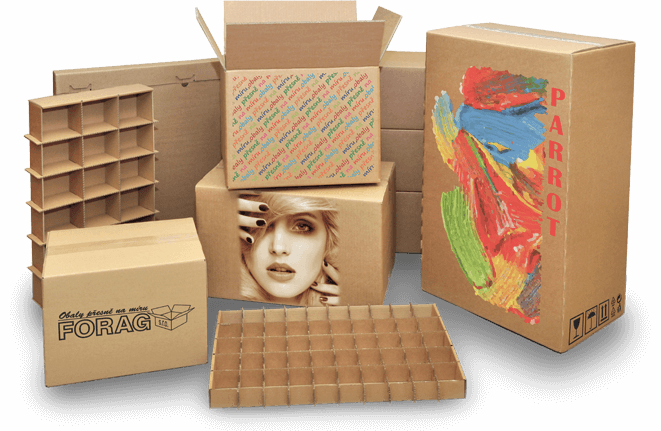 We offer cardboard packaging solutions made of solid and corrugated cardboard. Slotted, cut out, die-cut, transport boxes. Looking for a different shape? We help our clients package anything with our made-to-measure packaging solutions. Show you are unique with unique packaging. Your corrugated cardboard packaging may be printed on using available printing techniques. Minimum amount is just 1 piece. We make your packaging shine in bright colours. Our packaging solutions ensure no compromises are made with regard to the protection of your products. That is why we only use top-quality and highly durable materials. Your products deserve the best protection available. We take pride in providing packaging solutions which are produced with precision to a hundredth of a millimetre. We are detail oriented. This applies both to our work and keeping deadlines. You will not miss any business opportunity if you rely on us. We always do what we promise and when we promise to do it. Interested in a complete list of our services and prices? Ask for a non-binding quote.